1. Cut the aubergines in half lengthways, then cut each half into 3 or 4 long wedges. Heat 1 tbsp of the sesame oil in a large frying pan or wok until hot. Fry the aubergine wedges in batches until golden, adding a further 1 tbsp of the oil when needed. Remove from the pan and set aside. 2. Heat the remaining oil and fry the garlic, ginger and salad onions until golden and aromatic. Add the rice wine, soy sauce, fish sauce and stock. 3. Return the aubergine to the pan, cover with a lid and cook for 20 minutes until the aubergine is tender and ‘gives’. Drizzle over the honey, turn to combine and remove from the heat. Meanwhile, plunge the beansprouts in a pan of boiling water and cook for 2 minutes. Drain well and toss with the chillies and coriander to combine. 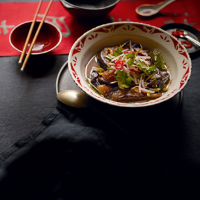 Spoon the aubergine into bowls and top with the beansprout salad.